A PDF magazine for students and graduates of complementary therapy. Whether qualified or studying, attendance based or distance learning training, we regularly bring news and views, and articles that we hope will be thought provoking. For information on the current issue, and back issues when available, please visit our Facebook page or email. Purchasing via this web page is for the current and most recent issues, which will be emailed as a PDF file as soon as possible, but in any event within 3 working days. Practice Management Zone – Supplements, products and other "add ons"
Practice Management Zone – What is the competition doing? Does it matter? Distance Learning Zone – Insurance and professional associations. 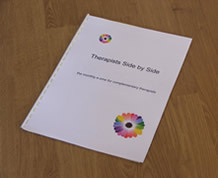 Manuals for self study, designed to provide complementary therapists seeking continuing professional development study (CPD) with additional information on various subjects related to complementary therapy practice. Written by practicing therapists for therapists or students of complementary therapy, manuals assume knowledge of the basics of anatomy and physiology. Please note that the authors do not offer any form of examination, certificate of proficiency or accreditation. Further manuals will be added soon. If you wish to be emailed with further information as they become available, please contact us. Please note that hard copies of the manual are printed on demand, please allow 5 working days for dispatch. We recommend the PDF version for overseas customers, and those wanting the manual quickly. 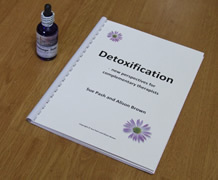 This manual, written by Therapy Network practitioners Sue Pash and Alison Brown covers the basics of the anatomy and physiology of detoxification, but goes into greater depth about the issues surrounding detoxification, and how to integrate detoxification techniques into a complementary therapy practice, whether that practice be nutrition, stress management, or any of the "hands on" therapies such as massage etc. It also gives information on making "strategic relationships" with other therapists so that the "missing" part of a therapist's vision for how they want their complementary therapy practice to develop can be integrated, for example the nutritional therapist or homeopath making a strategic relationship with a massage therapist for when lymphatic drainage techniques would be of benefit to a client. There is information on detoxification in relation to complex homeopathy, iridology, massage, and many other therapies, along with simple self help tips to offer clients who may be looking at detoxification to aid weight loss.